Wheal Augusta was a successful Barite mine in South Devon on the edge of Dartmoor National Park. The ore has a banded appearance and was locally termed ‘bacon ore’. Wheal Augusta was originally started around 1849 as a lead mine under the name Bridford Wheal Augusta. Production switched to Barite in 1850 with the name change to Bridford Barytes Mine. 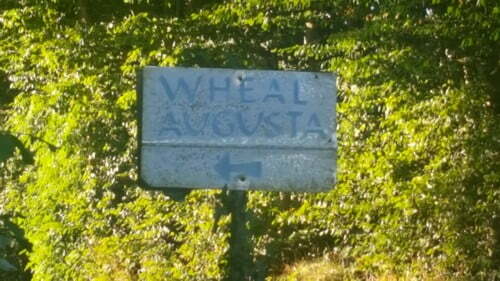 Initially, Wheal Augusta was an open cast works (SX829866). The sett was then developed underground from a site slightly to the south, working the lode which was up to 6 feet wide down to about 85 fathoms (about 200 ft below sea level). Peak production at 24000 tons per year was reached in the 1940s but it finally closed probably on July 31st 1958. Estimated Average Annual Production of Barytes from Bridford Mine, 18 75-1958.